Peanuts! I Don’t Remember Eating Peanuts! AS REGULAR READERS OF THIS BLOG KNOW, I went to the 99¢ Only Store today. Well, that’s not to say a box of these struck me, thrown from some unseen hand, as though that particular 99¢ Only Store is infested with poltergeists. That’s not what I’m saying at all. But that would be kind of neat if that were the case. It might keep some of those afore-hinted-at ladies in line, if you know what I mean, and by Godfrey, I think you do. Those people are probably very superstitious. I’m sure they’ve got some quaint name that covers all unexplained phenomena. 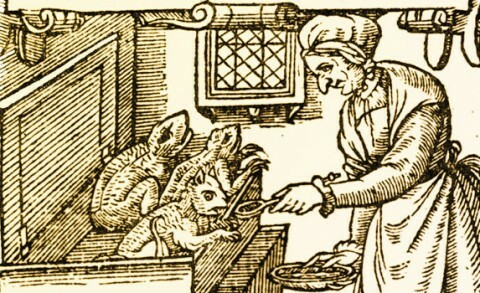 It’s likely, in their typically backwards fashion, they ascribe everything they can’t explain to some sort of mischievous witch or imp or something. From their rich ethnic folklore. Probably. Above: Oh-oh, vooden spoon gone missink? Probably ol’ Spovienka Bosorka usink eet for to feeds her skriatoks. No, friend, what hit me was the thought that here, today, in 2012, we have a non-peanut food labeled “PEANUTS” in a very much post-Peanuts comic strip era. At what point does this get confusing to consumers? If it hasn’t already…? You know that there are people today who are thinking this, because let’s face it, for about the last twenty years, Schulz’s characters haven’t exactly been in the public eye as they’d once been – like they were when you and me, pal, when we were growing up. Sure, comics pages carry “Classic Peanuts” now. (A move you’ll recall I predicted even before Schulz passed away; that is, you’d recall that if I’d had a blog then. Because I knew they were going to do that.) But younger generations don’t know these characters as “Peanuts.” If they have any frame of reference for these characters at all, they know the dog from the Met-Life commercials and, if they live in Southern California, from Knott’s Berry Farm. Schulz reportedly loathed the name “Peanuts” that the syndicate titled his strip. He’d hate it even more now, brother, knowing that its use is further devaluing his once vast licensing empire. 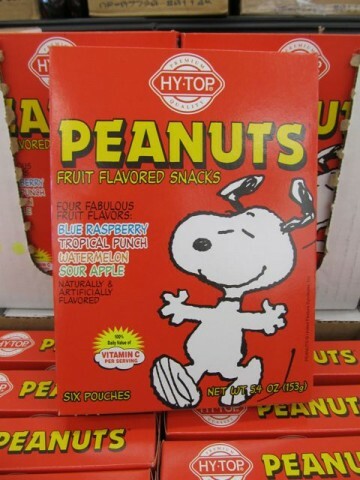 So labeling a food product like this as “Peanuts Fruit Snacks” (and not something obvious, like, gee, I dunno, “Snoopy Fruit Snacks”) is confusing and makes less and less sense as the property becomes decreasingly relevant. Unless these were boxes of peanuts. But they’re not, folks. They’re not. So who can really blame the ghost of ol’ Sparky for angrily tossing boxes of fruit snacks at the horrid peasant women who shop there? I for one applaud him, and who knows, I might even try to nail one of those hags myself with a box next time I’m at the store. I think we can all safely presume that as each box hits its mark and bounces off, said target will look surprised, arms back, elbows up, tongue sticking out, and above her head will be a squiggly line with a star at one end of it. And briefly materializing in the ether, a single onomatopoetic sound effect. Posted by Ted on March 19, 2012, 5:57 AM.